Climate change models project that much of the U.S. will experience warming temperatures, increased aridity, and more frequent drought events during the coming century. In response to these changes, populations must move, acclimate, or adapt to maintain population viability. Two critical adaptations for plants will be adjusting the seasonal timing of reproduction to match new seasonal norms and the ability to escape or avoid drought events. These are challenging phenotypes to study and consequently many basic questions remain unanswered. Do species currently possess the adaptive variation necessary to maintain fitness in future environments? Can adaptation occur quickly enough to adjust to rapidly changing conditions? Do genetic, physical or developmental constraints limit the variants available to meet future demands? One tractable way to address these questions is to examine how populations have adapted to spatial variation in climate that mirrors expected changes in climate over time. Figure: Mimulus guttatus inhabits a wide range of habitats from central Mexico to Alaska and from sea level to ~3000m asl. 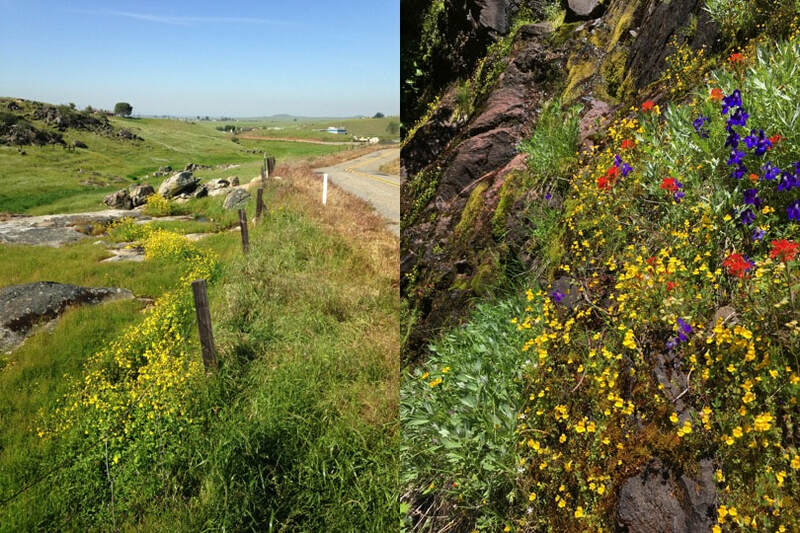 Growing seasons differ dramatically between populations such as the meadow in the central valley of California (above left) and the rockwall seep in central Oregon (above right). Plants must synchronize the seasonal timing of reproduction in order to flower under favorable seasonal conditions. To time flowering, plants use environmental cues such as photoperiod, temperature, and water availability. Altering these cues creates potential mismatches between species and environment that compromise population viability. Understanding how plants are able to integrate these cues into different flowering responses in divergent environments is essential for determining whether future adaptations can occur. Along with collaborators Ben Blackman, Jason Sexton, Dan Runcie and Akiko Satake, the Kooyers lab is investigating how a widespread plant, Mimulus guttatus, adapts to use environmental cues to optimally time flowering in variable environments. This work involves determining the genetic basis of responses to environmental cues for flowering, examining how such allelic variation corresponds to expression differences throughout the flowering gene regulatory network, and exploring how this variation acts to promote flowering and fitness within natural populations. The genetic and physiological mechanisms underlying adaptation to drought are poorly understood in plants, and few studies have demonstrated the fitness impacts of variation in drought resistance in natural populations. Plant adaptations to drought are generally classified into three strategies, drought escape, drought avoidance and drought tolerance, which are often viewed as mutually exclusive. Indeed, in Arabidopsis, drought escape and avoidance traits are controlled by the same gene where an allele that decreases flowering time also decreases water use efficiency. Annual M. guttatus populations in areas with short growing seasons exhibit a classic drought escape syndrome: rapid development and early flowering time. Our recent work demonstrates that M. guttatus also appears to possess adaptive variation in many traits that are typically associated with drought avoidance. Interestingly, plants in severely drought-stressed populations both flower rapidly and have high water use efficiency – a combination that contradicts our knowledge of plant physiology. 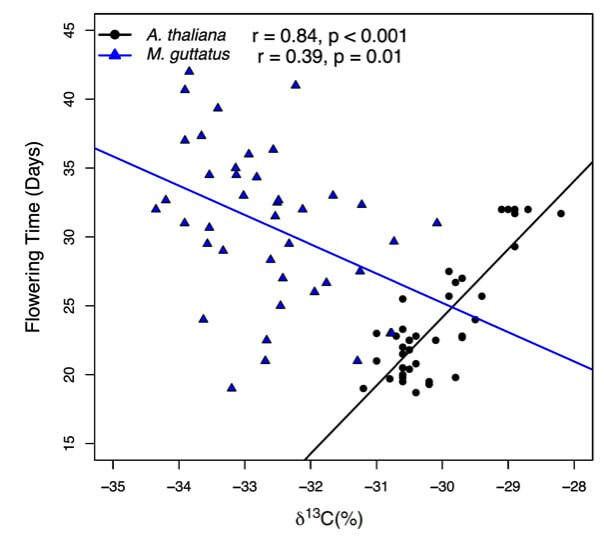 Figure: Scatterplot depicts the relationship between carbon isotope ratio and flowering time for Mimulus guttatus (blue triangles) and Arabidopsis thaliana (black circles). Points are population means for both species.